Known as one of the nation’s leading dance researchers, Dr. Katrina Hazzard-Donald, author, lecturer and professor is an author of two books and numerous articles on African-American dance and culture. 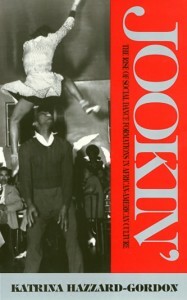 Her first book, Jookin’: The Rise of Social Dance Formations in African American Culture (Temple University Press), won the De La Torre Bueno special citation for dance research. She is the recipient of an American Council of Learned Societies Fellowship and the 1999 Oni Award from the International Black Women’s Congress. In addition to the book, she is the author of a number of articles in journals, anthologies and encyclopedias that explore the meaning, function and nature of African American Dance. She served as Guest Curator/Historian for the National Afro-American Museum’s 1999 exhibit “When The Spirit Moves: African American Dance in the United States” and as major voice in the both the Emmy nominated Public Broadcasting video “Swing, Bop and Hand Dance” and the Lincoln Center production “Free to Dance” currently airing on public broadcasting channels around the nation. In the 1960’s she worked for Delta Ministry in the Mississippi Delta towns of Greenville, Cleveland and Glen Allen, Mississippi. 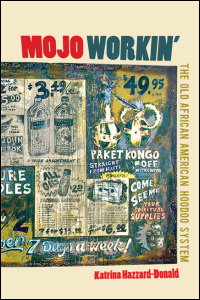 An Ogun Olorisha, or initiate to Ogun in the New World Yoruba/Lukumi tradition, Dr. Hazzard-Donald interviewed and worked with traditional African American Hoodoo workers for her second book Mojo Workin’: the Old African American Hoodoo System. Dr. Hazzard-Donald became interested in African traditional religion as a result of her involvement in studying and performing traditional African dance. Traditional African religions utilize dancing as a form of religious expression. In the process of study and practice she observed many similarities in how African religions approach human existence, problems and concerns, and that body of practices known to African Americans as Hoodoo, conjure or “root work.” Examining those similarities led to her current research interest and continuing work on the book. She has presented chapters from her forthcoming book at scholarly conferences across the nation and is currently chair of the African American Culture section of the Popular Culture Association. Professor Hazzard-Donald currently teaches Introduction to Sociology, Race & Ethnicity, Contemporary Social Problems, African American Culture, The Sociology of W.E.B. DuBois, Dance of the African Diaspora, and Dance Movement for the Theater. She currently lives in Philadelphia with her husband, daughter and maternal grandmother. Page last updated at 4:10 pm March 8, 2013 . This page was printed from katrinahazzarddonald.camden.rutgers.edu/ on Tuesday, April 23, 2019.